experience many European countries in clean, comfortable cars, with the latest technology, snacks and fine views. 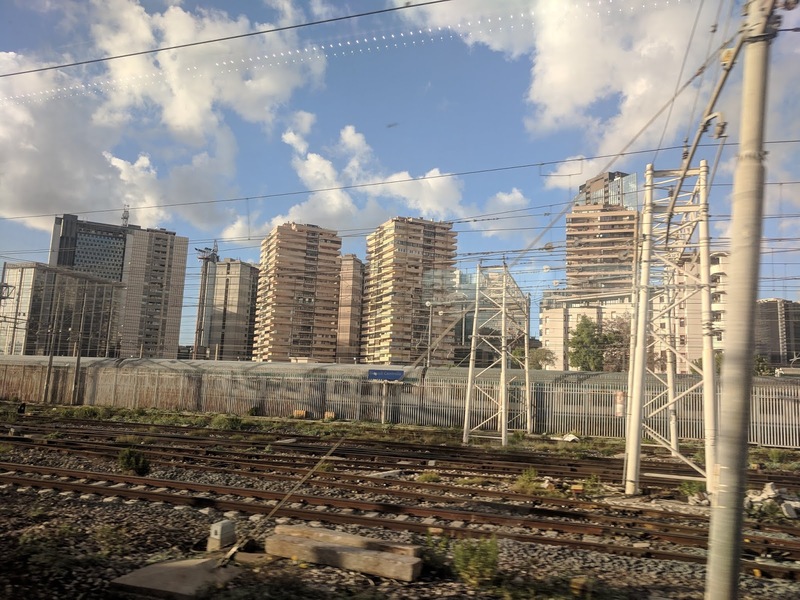 View from a first-class coach on a Eurail train between Rome and Florence. 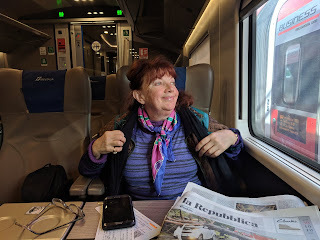 with the daily Italian paper, her phone and Eurail pass. FEELING LIKE 20-year olds again, we launched our latest European odyssey on Eurail. It was my 55th trip to Europe, and my partner's "20-somethingth," but for our last dozen years together, we'd rented cars, used planes and booked individual train reservations for our European forays. My last Eurail experience was in 1973, my partner's in 1977. 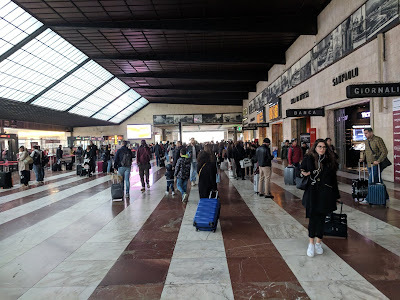 That time-honored train pass system, launched in 1959, requires purchasing ahead in the U.S. Our encore would satisfy our mutual desire to revisit Eurail, recapturing our youth in a delightful seven-week Eurail trip. THE EURAIL Pass, once known as "Europass" or "Eurorail pass," allows holders to travel in 31 European countries on most European railroads and even some ferry lines. Pass holders can visit Austria, Belgium, Bosnia Herzegovina, Bulgaria, Croatia, Czech Republic, Denmark, Finland, France, Germany, Greece, Hungary, Ireland, Italy, Luxembourg, Montenegro, the Netherlands, Norway, Poland and more. You can buy a Eurail pass if you reside outside Europe -- living in the USA, Canada, Australia, New Zealand, Asia or Africa. We met fellow travelers from all those places, including many Americans with whom we traded travel experiences, snacks and business cards. Europe's landscape glides by on Eurail, here entering Naples. EUROPE'S TRAIN system is huge and Eurail is only a part of it. There are no special Eurail trains. 'Eurail' is simply the brand name for the railpass options for overseas visitors to travel on normally scheduled European trains. Eurail passage is offered by an impressive co-operative network of 31 national train operators. A marketing team based in Utrecht in the Netherlands manages the Eurail scheme on behalf of the national train operators. It's a massive undertaking which works wonders in streamlining travel abroad. First, do some homework, remembering that you must purchase Eurail in the U.S. before your trip. Decide between first and second-class, both of which are fine and comfortable. A 3-month first-class ticket will cost around $2,000, less than a third that for our one-month passes, which worked beautifully with our trip. We book-ended cruises with the month-long land tour in the middle. continent. A Eurail pass makes it easy to move from country to country. FIRST-CLASS by train is lovely, comparable to comfort plus on the airplane. 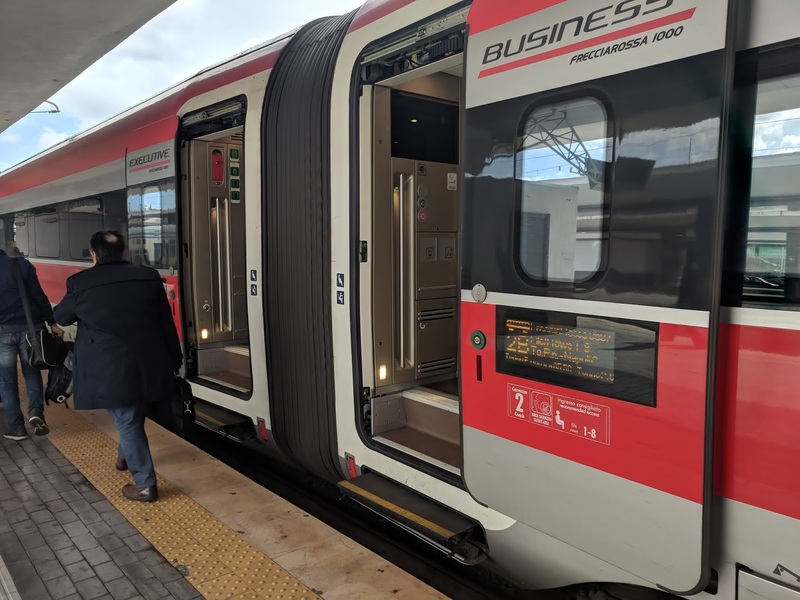 First-class is available on most longer-distance trains and if you can afford it, first is a bit nicer, with wider, plusher seats, more legroom. You'll also find nicely dressed businessmen on laptops and fewer families with kids in first class. You'll also get a little snack and beverage, but it's not the airlines, so don't expect free booze for your entire journey. A well stocked bar and snack car is near first class. 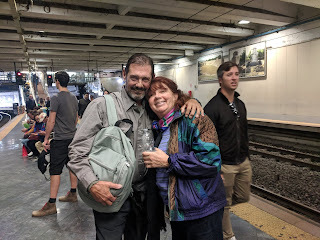 WE TRIED second-class for one of our segments-- Madrid to Barcelona. It was just fine. It's the way most Europeans travel - unless the company is paying. If you're booking a longer trip, there are sleeper trains of many types -- even deluxe sleepers with en suite toilet and shower. Once you purchase your Eurail pass, you've got 11 months to use. We activated our month-long passes on the 30th, and used them for the last time the 29th of the following month. Eurail offers a chance to enjoy beautiful train stations, here Naples. 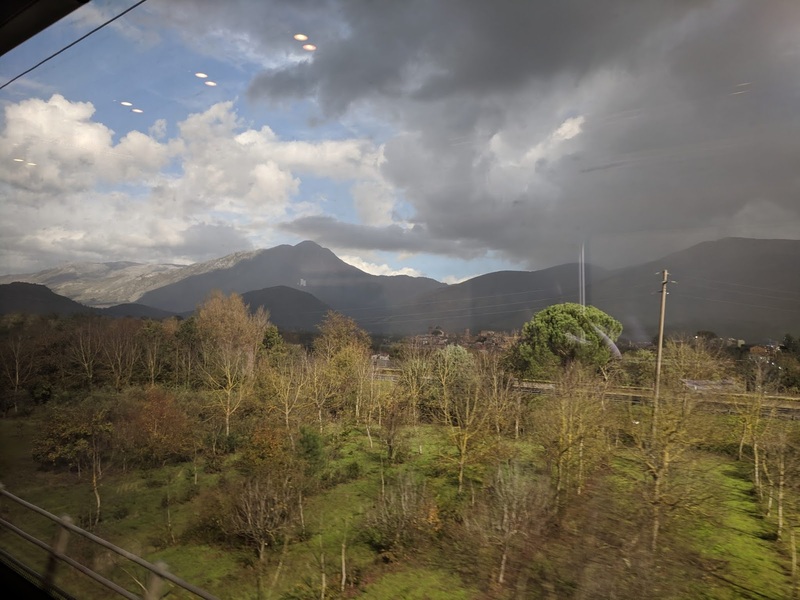 Once you've learned the system -- how to use your pass to arrange specific dates and times -- Eurail offers a relaxing way to travel without the stress of driving. We enjoyed excellent fast express trains where we met locals and tourists and watched Europe glide peacefully by. On some trains, a reservation is mandatory. Other reservations are optional. Some trains don't need a reservation at all. train station features artwork of the Tuscan countryside. and we were in the comfy, modern, first-class compartments with large windows -- we really enjoyed our return to Eurail. My techy partner, this column's ace photographer, also appreciated the technical amenities: hook-ups for our laptop and power for all modern devices. We had excellent cell reception except in the occasional tunnel, and used the on-line Eurail ap to check schedules and tickets. Be sure to swap out your U.S. sim card for a European version. For a little more than $40, we had unlimited communication with the greater world. More on that coming soon. Kudos to Eurail for rekindling happy memories as we revisited favorite cities and villages in swift, stylish comfort. the world. Their best viewings occur, however, in their own backyard. NEXT UP: On the trail of the great gray whale with Cookie and Keller. The magnificent creatures are heading south by the hundreds, passing by our San Diego perch. We're all eyes -- aboard Hornblower -- to see whales and dolphins and share with you, as they make their way to the Baja to give birth, nurse their young and fatten them up for the return trip home. Remember to explore, learn and live and visit us each Friday for a fresh take on travel, nature, the arts and family. What fun! We, too, visited Europe with Eurail passes in the 1970s. You've inspired us to stage an encore! Wow! We will definitely try this. Have wanted to explore Eurail for years. You make it sound so inviting. Fun photos, too. Excellent overview of a time honored way to travel Europe. Fine story and fun photos. We have wondered if Eurail could be as much fun as it was in our youth. You have convinced us! We are grateful.